Martin and Eliza have spent the last few months compiling and curating a collection of musical and poetical works from the East of England. Their side of the country contains myths, legends, poems and ballads from the furthest North of Northumberland, through Hull right down to Suffolk, where you can also find East Anglian step dancing, here performed by Ewan with the band. 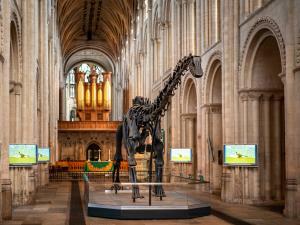 The grand setting of Norwich cathedral will be the perfect place to hear these epic stories and see traditional dancing, from Pete Morgan’s famous Robin Hood’s Bay poem “Drowned at Sea to Dead on Land”, to the joyful stepping of East Anglian rhythmic dance, and maybe a bit of solo Rapper thrown in. Expect a connection to the land and the coast, great stories and a real sense of what the history and traditions of the East have to offer. Take the A47 to Norwich. Norwich Cathedral is situated in Tombland.